Newspaper Rock: Origin of "Indian giver"
I think I've posted an origin of "Indian giver" before. It comes up whenever someone uses the phrase. By Lakshmi GandhiSlaughter writes that in one instance, a group of Indians offered Lewis and Clark some roots, which the explorers rejected because they felt that "[the Indians'] expectation for those presents of a few roots is three or four times their real worth." 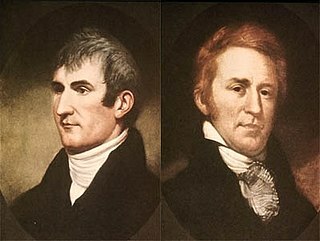 Turning down the gift, however, insulted their hosts and led Lewis and Clark to label the Indians "forward and impertinent, and thievish," in their journals. "To an Indian, the giving of gifts was an extension of this system of trade and a gift was expected to be reciprocated with something of equal value. Europeans, upon encountering this practice, misunderstood it, considering it uncouth and impolite. To them, trade was conducted with money and gifts were freely given with nothing expected in return. So this native practice got a bad reputation among the white colonists of North America and the term eventually became a playground insult." This definition stuck and the phrase "Indian giver" made its first appearance in linguist John Russell Barlett's Dictionary of Americanisms in 1848.Comment: I've read various explanations of "Indian giver" before. Including one claim that it referred to the white man's penchant for making and breaking deals. But the above explanation may be the most common one. I don't know if most people think it began with Lewis and Clark, but most think it refers to a misunderstanding of Native customs. For more on "Indian giver," see Limbaugh Calls Warren "Squaw Indian Giver" and Lauer Calls Vieira "Indian Giver." Misty Upham on filming Jimmy P.
Del Toro: Redface is "tradition"
Reilly: "White America" hates "Redskins"
Canadian app store censors "Redskins"
Students chant "white man, steal our land"
Racists think "equality was achieved"
NFL's Goodell softens on "Redskins"
Elizabeth Kartchner's "Little Indian Party"
Oneida to campaign against "Redskins"